Tribes of Galway, Ireland: My Peeps. Road Trip! The History Junkie is preparing for a jaunt across the pond to Ireland, on holiday. In doing a little background for the trip, I came to find out that I am directly descended from two of the original Tribes of Galway–the Athy and Martin families. So cool! 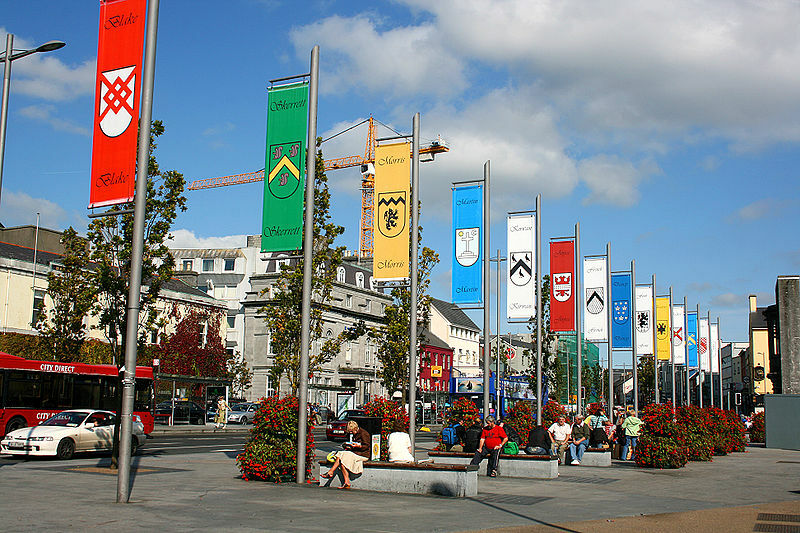 In short, Galway is a city located on the western coast of Ireland. The Tribes of Galway were fourteen early families who steered the community, in business, politically and socially, from the 13th century through the 17th century. My Athy family was Anglo-Norman, coming to England from France. In the early 14th century, Sir William de Athy, a knight at Ardree, built the first stone residence at Galway. It would come to be known as Athy Castle. His descendants would join with 13 other Anglo-Norman families to build a wall around Galway, and lead it for the next 400 years. The Tribes of Galway maintained their Roman Catholic ways, even in direct opposition to the Protestant English crown. They joined the Irish Rebellion in 1643, throwing out the protestant garrison at Galway. But in 1652, the Tribes of Galway were defeated by Cromwell’s invading forces. Because of their Catholic faith and direct opposition to Cromwell, the families were stripped of their possessions and standing. My great-great-great-great-great-great-great-great-great (nine) grandfather, George Athy, born in Galway in 1642, saw no future in Ireland after Cromwell’s takeover. Upon reaching adulthood, likely with little or nothing to call his own, George sailed for America in 1661 and would settle in Catholic-friendly Maryland. He completed a seven-year bondservant term, then went on to live a rich, full life, including a wife, children, land ownership and service as a captain in the Prince Georges County, Maryland Foot Militia. He died around 1710, laying the groundwork for generations to come. Always interesting to look back. We are a measure of those who came before us. It’s an honor to say that a part of George Athy and the Tribes of Galway lives in me. My husband Charles Price is a direct lineage from George Athey on his fathers family. They are from W. Va. and I have found lines directly to George Athey. You are cousins I’m sure. All of your information lines up with mine. I am working on the Price lineage while doing my family the Clinton line. I would like to hear from you. Yeah, sounds like we’re cousins. Which of George’s children does your husband descend from? My line is through George’s son, John, who married Margaret Lewis. Hope to hear from you. Welcome aboard the site. Hi —– Also descendant of George Athey through son John & Margaret Lewis; then son Thomas; daughter Eleanor Lucille who married John Dawkins. Info on the Athey Reunion is appreciated. Thank you! My husband is from the sibling Francis (son) and eventually into the Price (Welsh) line in W. Virginia. Yeah you are cousins. I too descend from George Athy. My grandfather was a direct male descendant of George through Thomas, Owen, Joseph, Electious, Hezekiah, and Charles to my grandfather Ernal Ross. Joseph changed the name to Athon in my line. I am a direct descendant of George Athey of Galway..
Great to hear from you. Front Royal, huh? My family and I were actually out there a few years back, but I don’t think I will be making it this time. Hope they have a great turn out. I am related to George Athy… But i am a dicendent from his daughter Elizabeth Athy and his wife Ann Moorewood… George Athy is my 9th Great Grandfath…. I would like to get to know some of the people that I’m related to even if they are very distant related.. please email me at xxgodxxdarth@gmail.com. I have a Y DNA match with several Atheys that claim descendants from Captain George Athey. As my surnames is Shannon, I haven’t figured out the connection yet. This is a wonderful and very interesting site and I am grateful to its author(s). I, too, am a descendant of the Athey family. Greetings from the Commonwealth of Virginia! My mother maiden is Athey and that it is how the spelling is in America. Her grandfather Stiny McGill Athy is from Galway Ireland. I have heard that my moms family has royalty connections. I’m searching for my ancestry history. I m a decendant of the same line.